Life is not measured by the number of breaths you take, but by the moments that take your breath away…. Wherever you wear it, the Delphine Ostrich Feather Skirt is a grand statement piece. 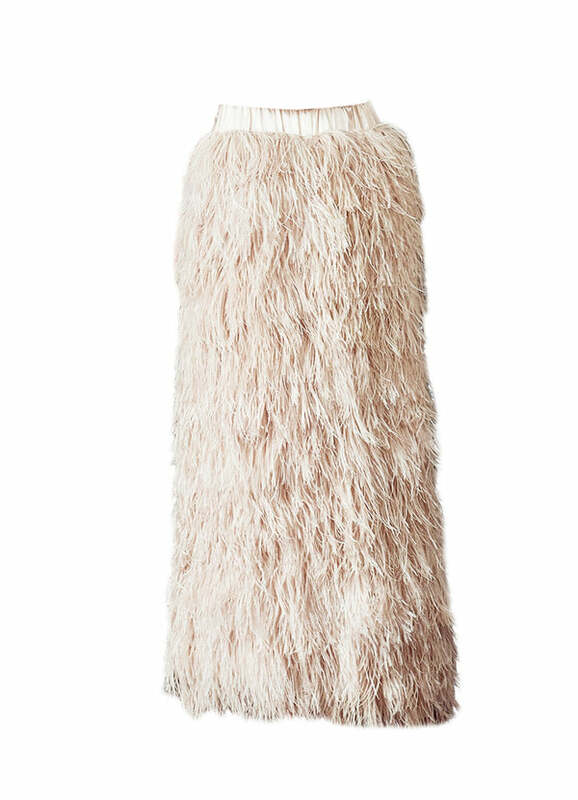 Expect to be noticed in this floor length delicate ostrich feather skirt in blush. Our most luxurious (and most talked about) item featured in the Plume Feather Collection 2017, this feather skirt is completely covered in the softest and most delicate ostrich feathers. Truly unique and utterly glamorous. The elasticated waist means it is a more relaxed fit and extremely comfortable to slip on and wear. The feather skirt also features a split which can be positioned at the centre on the front or back, or to the side. Style the Delphine Skirt with a simple silk cami, white tee or bustier. True to size tailored fit. Keep in mind the satin lining provides very little give. Subtle split just above the knee (or mid-thigh depending on your height!) to allow for elegant movement. Skirt length is 94cm. 100% Ostrich feather outer, with soft satin lining inner and elasticised waist band.